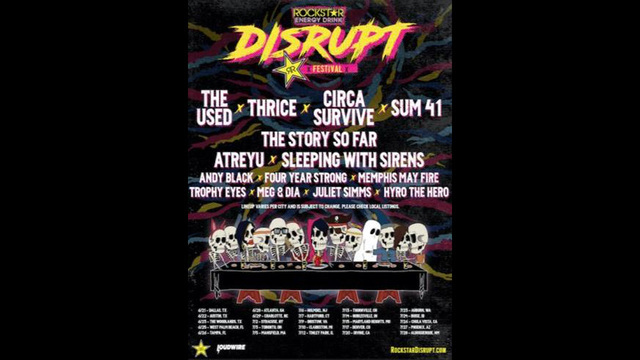 GEDDES, N.Y. (WSYR-TV) - The inaugural Rockstar Energy Drink Disrupt Festival is coming to Syracuse for one of 25 shows across North America. The Disrupt Festival comes on the heels of the end of Vans' Warped Tour. The lineup features several groups who have performed on Warped Tour stages, among other punk and rock groups. Listed in the lineup are The Used, Sleeping With Sirens, Andy Black, Thrice, Circa Survive, The Story So Far, Atreyu, Four Years Strong, Memphis May Fire, Trophy Eyes, Juliet Simms, and Hyro the Hero. The show will take place at the St. Joseph's Health Amphitheater at Lakeview on July 2 beginning at 1 p.m. There will be two stages for the event. Prices range from $19.99 to $69.